Generates beams of light emitting from the bright areas of the source clip. Lower the Threshold parameter to generate rays from more areas or raise it to generate rays from only the brightest areas. Set the Rays Res parameter to 1/2 for faster rendering with slightly softer rays. Mode: Popup menu, Default: Light Rays . Selects between light and dark rays. 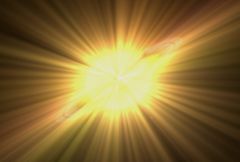 Light Rays: Generates beams of light emitting from the bright areas of the source. Dark Rays: Generates beams of darkness emitting from the dark areas of the source. Rays Brightness: Default: 3, Range: 0 or greater. Rays Darkness: Default: 3, Range: 0 or greater. Scales the intensity of the dark ray beams. Rays Color: Default rgb: [0 0 0]. Rays are generated from locations in the source clip that are brighter than this value. A value of 0.9 causes rays at only the brightest spots. A value of 0 causes rays for every non-black area. This can be used to raise the threshold on a specific color and thereby reduce the rays generated on areas of the source clip containing that color. Set to 1 to generate rays from the source's alpha channel instead of its RGB channels. This will typically cause many more rays to be generated. Values between 0 and 1 interpolate between using the RGB and the Alpha.